In my view, one of the larger surprises of the past few years has been the stability of inflation rates. As I discussed earlier, the best intermediate-term inflation forecast technique for the last couple of decades (for example, a 5-year forecast) has been to stick with a 2% forecast. (Although 2.5% is probably a better level to use for the U.S. CPI instead of 2%.) 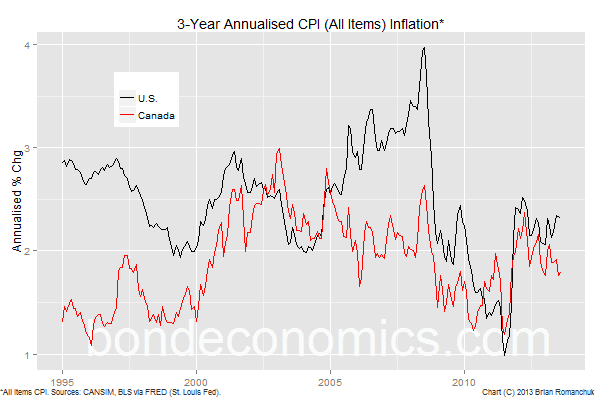 As the chart above shows, although the 3-year annualised inflation has moved around a bit, it is still bouncing around this average level. This stability appears surprising given the magnitude of the slowdown in the United States economy. My guess is that a considerable number of inflation models have had to been scrapped over the past few years. The path of least resistance is to not worry about inflation, and hope that policymakers (and the markets) will continue to hit a 2% level on average going forward. However, digging further into inflation trends is worthwhile if you are a financial market participant who has reason to care about macro trends, or for those who need to project a cost-of-living for personal financing planning purposes. One thing highlighted by national statistical agencies is that the CPI index is not a cost-of-living index. In other words, personal expenses in a financial plan should not be expected to follow the trend in the CPI exactly. Within North America, there can be important regional differences due to diverging fortunes across the country. Another important factor is that one’s spending patterns will not match the averages used in the basket used in the CPI. That disclaimer aside, the CPI should shed some light on how your cost of living will change over time. In order to project inflation going forward, we need to understand its historical trends. In a low-inflation environment, the divergences between different components of the CPI may become significant relative to the overall level of inflation. This behaviour is not captured in models that look only at the aggregate price level, in other words treating the economy as if only a single good was produced. 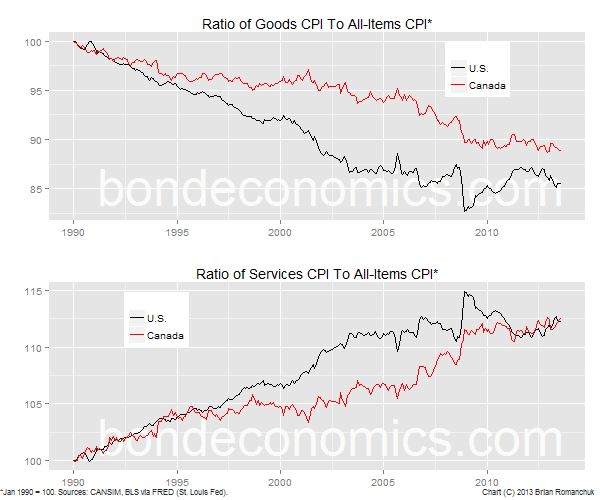 And as the chart below shows, there was a considerable divergence in the relative pricing power of goods versus services. What we saw was that goods* prices fell relative to the aggregate CPI (in other words, they rose less quickly) during the 1990’s. This was a general phenomenon across the developed world; I am showing the similarity of the U.S. and Canadian experiences in my charts. Since goods were falling versus the aggregate, services had to be rising faster than the aggregate. This is typically explained by the impact of increasing globalisation reducing the price of traded goods, while services are produced domestically. What is interesting is that relative price shift has slowed or even stopped over the past few years, first in the U.S., then Canada. This is an area that I am still looking at, but my working hypothesis is that this is cyclical. The service sector was able to push through price increases more easily when the domestic economy was in better shape. Given that the economy remains in slow-growth mode, divergences in inflation rates may be suppressed for a while longer. However, there is also a risk that if the deflationary forces from traded goods prices are finished, inflation rates could prove to be surprisingly strong when the economy eventually returns to being near full capacity. * The Bureau of Labor Statistics of the United States refers to the goods component of the CPI as “commodities”, which I find is confusing.